In March, the news about a brewery opening in Elizabethtown made for an exciting development about business in the borough. And then, the new owner of MoviE-town announced upgrades to the theaters. These two posts were the top posts in the past month. As exciting as both of these are, I would submit that soemthing Borough Council approved last week is even more important to the long-term health of the community: a Local Economic Revitalization Tax Abatement (LERTA) program. Ramon Escudero, executive director of the Elizabethtown Chamber of Commerce, laid out a proposal to create the LERTA at council's meeting in early March. Basically, it works like this: Borough Council identifies properties that are deteriorated and makes them eligible to participate in the LERTA program. Property owners then can make improvements without taxes skyrocketing because of the improvements. The program sets up a schedule of paying 10 percent of the new tax rate for 10 years, so that by year 10 a property owner is paying 100 percent of the taxes owed. The beauty of the program is that the borough, the Elizabethtown Area School District and Lancaster County don't lose any of their current revenue because the program requires property owners continue to pay their current taxes. They only get a break on how much the improvements would be taxed. From government's perspective, this is great because we continue at our same revenue levels. For the business owner, he or she can do better planning for cash flow. Before any of these properties will see improvements as part of the LERTA, the school board has to approve it, after which the county commissioners will consider it. Borough staff indicated that it might be the fall before the LERTA makes it to the school board's agenda. After they have approved it, the property owners will have 5 years to make improvements unless council decides to extend that time. Council could also expand the program for other properties or areas of the borough. Escudero told Borough Council that the chamber worked on a LERTA program in West Donegal Township to sweeten the pot for Nordstrom's to build a fulfillment center at the Conewago Industrial Park. 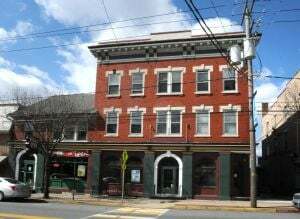 In a borough like Elizabethtown, which doesn't have open space for new buildings, the need it to revitalize buildings that are in poor condition. Consider the Elizabethtown Hotel, which has been vacant for many years. Or Roth's Furniture, which sat empty until a shop called Bad Boys Toys selling drug paraphernalia opened (and was shut down shortly thereafter in a drug raid). The LERTA gives property owners a creative way to finance improvments, which will go a long way toward improving -- and preserving -- iconic downtown buildings. It's an idea that keeps the long-term health and vitality of the community in mind. For that, I give kudos to Escudero and the chamber of commerce.